I had a small show recently in the Bridewell Gallery, which was initially supposed to be for one day only but ended up lasting a week. I wasn’t certain even the day before that it would happen, as I had injured my back and could barely walk. One piece was shelved as it involved me walking to make it and I had to rely on others to carry the paintings from the studio to the gallery. There were only three paintings and over the whole week, footfall was in single digits, so why did I bother? I grew up in a village. We moved there from a town in autumn 1975. Events were based around the church and it’s various festivals or the village hall and it’s interest groups; Book club, Art club, flower arrangers and growers of outsized vegetables. The village had it’s eccentrics, the unintelligible drunk who regularly slept in a ditch, the ghostly Victorian lady who lived in a tiny cottage, hidden by ivy and whose widows weeds covered her from her veiled face to beyond her feet, giving the impression that she floated as she moved and the penniless ‘Lord’ of the Manor who had squandered his wealth way back when, in casinos and bookies and whose house was falling down around him. There were many pensioners living there, all of whom had experienced life during the Second World War and some who had experience of the first. WW1 began sixty-one years before we moved to the village. This meant that anyone sixty-six and upwards would remember something about it and would have been affected by it. Any male seventy-five and upwards may well have fought in it as boys lied about their age to enlist and the authorities did very little to discourage this. Ninety-eight served. Fifteen didn’t return. Today the village has a population of seven hundred and I imagine that hasn’t changed very much since 1914. The impact of this mechanised carnage was huge on this village and every other village, town and city in the land. The memorial was in the middle of the village with the names of those who served and died carved into stone. There were repetitions of family names. One of my friends, had a representation of five of his family, another had four. What had seemed like a great adventure to many volunteers soon became a nightmare and those that returned were changed forever. At secondary school we studied the war poets and as my knowledge of the subject grew, so did my anger at the pointlessness of it all. It was always difficult to watch the survivors, Harry Patch and the other centenarians break down before the cameras, remembering something that happened eighty years before; men who lived long lives and suffered for their longevity. Harry Patch, the last survivor who experienced the trenches, died in 2009 ages 111. So what is the relevance of this back-story? Well, I felt that it was important for me personally, maybe as some kind of exorcism, to mark the Centenary of the Armistice. I ended up hanging three paintings - two from a recent exhibition and a third new one. The new one, ‘All Quiet on the Western Front - In Flanders Fields’, was based on the poem ‘In Flanders Fields’. It references the rows of crosses and poppies between and the rows of a ploughed field. The rhyme scheme is reflected by the change of reds used for the rows, one of which is a chlorine gas green separating the first nine lines from the last six. I used soil mixed with the paint for the bottom half of the work as the majority of my paintings are tied to the landscape in some way and to reference the mud bath that was the trenches. The top half is a lighter ephemeral space. The second painting was ‘Elysian Fields’. Again, the landscape influences the composition with rectangular field shapes interlocking and a break between land and sky. The autumnal colours are a simple metaphor for the end of the day/life. 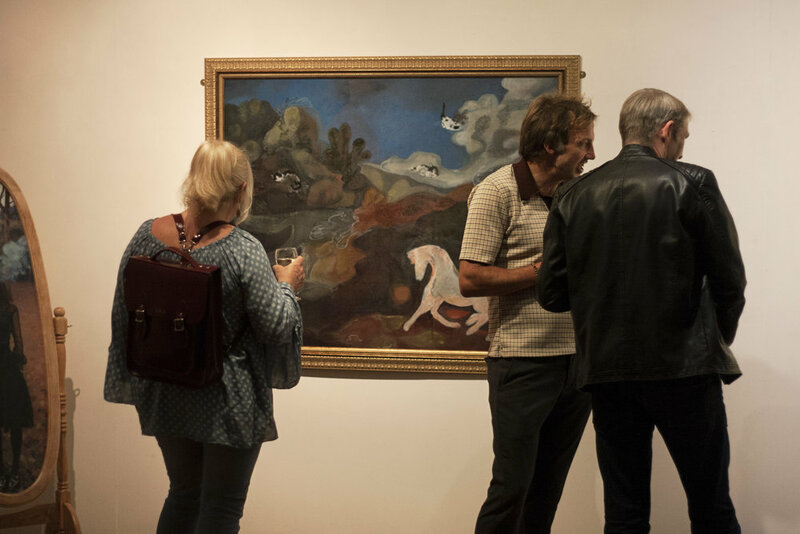 I felt the relevance of the Elysian Fields as a place where the Greeks believed their heroes would spend eternity fitted with the theme of the exhibition. Finally, I included ‘Islands’ as an antidote to the other two as it is about communicating. Two flag-like shapes interact amongst a starry universe, if they don’t then they are just lonely islands in the emptiness. It is an anti-Brexit, anti-isolation, anti war painting. It is about love. Six artists have created a multi-disciplined show on the theme of ‘Smoke and Fire’ using various spaces within this historic building. The title was triggered by a house fire experienced by two of the exhibiting artists and it explores personal experiences, folklore, popular culture and primal urges through painting, sculpture and site specific installations. The main gallery is dimly lit at one end brighter at the other. A clay chimney sits in the gloom with a small round cloud suspended above it. There is a glow from within but no heat. The scale is unconfirmed. Are we viewing a large object from a distance? As we know, clouds are fairly large and the chimney dwarfs it. This would make the surrounding gallery a proportionally huge voluminous space. Or is the size it looks in reality? This could make the cloud a tiny magical creation part way through a conjured water cycle waiting for wind to gently position its sooty contents over lines of drying white washing. The rest of the gallery is filled with paintings, video, a light box and a strange blue flame mask which manages to be quite cute and Smurflike on one hand and terrifyingly on the other to some kind of blue supremacy. It cleverly conveys the duality of our relationship with fire as being both a comfort and a danger. 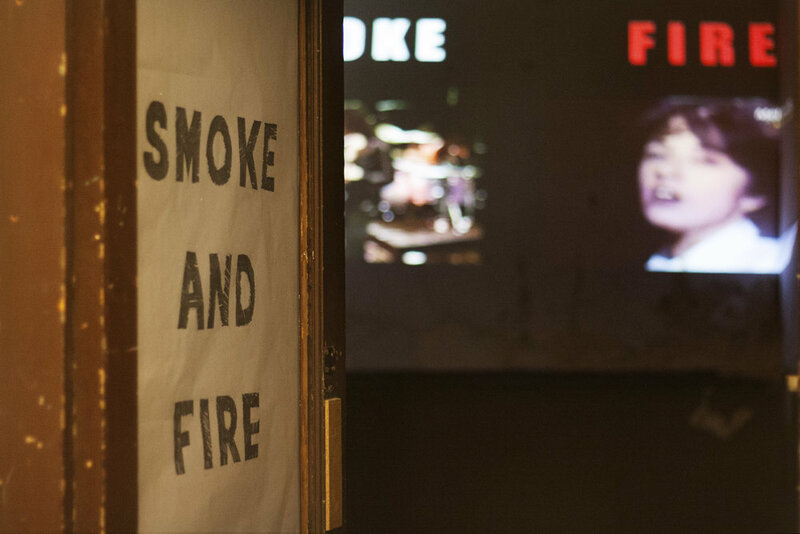 In the basement is a claustrophobic room in which simultaneous videos are shown on the theme of smoke and fire. Plucked from pop culture through the ages from The Wizard of Oz to the Crazy World of Arthur Brown the sounds and images lick the wall like flames reaching out towards the viewer. The third part of the show takes place in the cells of the old police station. Burning Well, a docu-vid on a small screen, documents a strange bubbling well where the water in the ensuing brook can be ignited like brandy at Christmas even though water is still cold to the touch. The breezy reed-scape is reminiscent of the terrifying classic Onibaba a Japanese horror film from the 1960s and a full moon adds to the feeling that the Burning Well is a portal to an older time of mystery and magic. Finally in a cell stand two pairs of footwear, one male, one female. From them protrude what looks like stumps of charred leg bones. Called Brief Encounters it is a metaphorical remnant of past relationships. The surrounding soot is made of memory - Love and passion, hurt and anger or maybe just indifference. It reminds us that we will all become fading memories as we turn to dust. Brendan Lyons is a painter who has exhibited for many years producing stand alone and site specific work. He is based at the Bridewell where I interviewed him in his studio. IF I was blown away by the incredible trompe l’oeil effect in your work. Can you tell me a bit about how you create this and why you use it? BL I started by drawing. Making the canvas and staples by drawing on paper and adding them to the board. They were in the Jerwood drawing prize a couple of times. When I did them in paint they didn’t quite work until a few years ago when I developed a better technique. Well you’ve got to get the texture onto the paint and it has to have the right matt finish but you can get away with a lot of it by using the way the brain works. Once your eyes send the signals to the brain it quickly tells you what it thinks it is. Yeah. I’ve only painted these little bits but the brain tells you that canvas has been pulled off leaving these scraps but of course it was never there. We looked at other works. One which when installed looks like a brown canvas silver taped to the wall across its middle and one masquerading as made of black bin bags. Well in the past every single element would be paint so there was no escape from it. So the structure and everything else would be paint which worked in that I could say the whole thing is made of paint and you don’t have to distinguish which is and which isn’t. I found that as an artist I got stuck in a trap and ended up making the same thing over and over again. So for me to get a bit more enjoyment and fun out of it I opened it up and I now have more confidence to do whatever I want. Now I mix it up with other materials and then I have to tell people which bit is paint and which isn’t by giving them clues which I do by making it look more painterly. On the other hand I did a few installation pieces that were site specific. Therefore when I didn’t have a specific site in mind I didn’t make the work. I got trapped by being very conceptually sound which is why I make these other pieces about what I can do with paint in a painterly way. We go to the other room in his studio to look at this other strand of Brendan’s work. It’s more playful and painterly but no less meticulously made than the trompe l’oeil work. I’d remembered a copper plate and red paint piece from Brendan’s Instagram page. Like all of these newer works the paint is manipulated into a multitude of individual peaks like the strange alien landscapes from early sci-fi. A lot of people know my work from Instagram photos. I often photograph them close up so they look like landscapes and there’s not much of a clue as to scale. I intend to use photos as standalone pieces alongside the work. I was given these copper plates which are all the same size so I’ve done a series and not had to think too much about it working as a series. They are also a nice size in terms of working quickly and becoming more sculptural. This one even revolves on a plinth to emphasise its sculptural nature. I have to manipulate the paint so it looks natural. The peaks and colour changes are interacting with one another as if they’ve been caught in a little moment. Yeah, the drying time and the flexibility of acrylic is something which oil couldn’t do. Because it’s made with a polymer binder and a pigment it’s designed not to crack and that property means you can do all sorts with it. I think it’s going to continue going in ways that interests me. A few years ago, I wouldn’t have made these so to me that’s interesting in itself. I am happy for the two distinct strands in my work to run alongside each other. I’ve done a lot of work on windows and I always like to reference painting so not for the time being. Certainly with the red one but some of these are also fleshy colours so there is the idea of skins and fleshes and the film/skin of paint. Although they’re not convincing as skin they are touching on it and they end up somewhere between all those things and not definitely any of them. I think I’ve become more confident about what the paint will do rather than just guessing at it. One of the things about the medium of paint is that people know what it is and you as an artist are playing within that game from day one. When you play with those references that’s when it’s quite enjoyable for everyone.